Did you make your New Year’s resolutions? Over 140 million Americans do so you’re not alone. If you’re one of them, discover my 3 Tips for Tackling this New Year! New Year’s resolutions, while popular, fail horribly within the first 2 months. Find out 3 things you can do to ensure you start 2017 in a position to finish strong! Here we are, 3 days into 2017 and already I’ll bet you’re slipping on those resolutions you made. If so, then welcome to a very large club! According to Statistic Brain, out of the over 140 million people in the US who make New Year’s resolutions, only 8% of people are successful in actually achieving them. Personally, I’m not surprised. I’ve never been a fan myself so I don’t make them. They seem like a silly fad that people do because they feel pressured into doing so, instead of committing to a very select ambition or two that you’re extremely passionate about. Achieving any goal takes effort, passion, diligence and commitment – none of which seem to me to exist simply because it’s “that time of year” or because it’s “what you do”. But, I do realize that people love to have fresh starts, and the beginning of a brand new year is the perfect time to do so. With 2017 in it’s infancy, and a brand new softball season on the horizon, here are my 3 tips for tackling this new year. Instead of starting 2017 with a great set of goals, shoot for finishing this year with a couple of big things accomplished. So here’s to hoping your 2017 is fantastic! Notice the Starting Line – too often, we can let all the talk about resolutions for the New Year overwhelm us by making us realize all of our deficits. Try instead, to turn around and take a minute to really see just how far you’ve come. Sure, you might want to lose 20 lbs., but notice that you’ve started eating a little bit better. Or you might want to become a more successful coach, but acknowledge that you’ve signed up for our new Vault Classic! Or You might want to be a more engaged parent, so realize you now turn off your phone for the first hour that you see your kids each day. Tackling big goals takes energy, and too often we only look at how far we are from where we want to be, which can be very draining. Instead, turn around, and notice how far you’ve come, and you just might get that needed energy boost that will propel you into your next step! Take Baby Steps – and speaking of steps, take small, baby steps toward your bigger goals. Instead of trying to simply lose 20 lbs., try instead to lose 1 ½ lbs. a month, or ¼ lb. a week! That sounds much more doable than 20 lbs. The smaller you make your goal the more possible achieving that goal will seem. To reach a goal you must first make your brain and heart believe it’s actually possible. Possible is the world of action, im-possible is the world of in-action. Make real progress by taking your bigger goals and breaking them up into smaller, baby-goals. 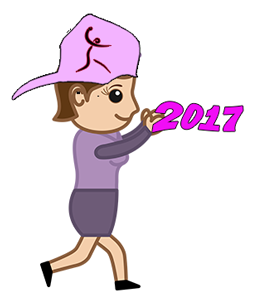 Baby step your way through 2017! Make Your Own Path – I know it’s popular to make New Year’s Resolutions, but like I said, I’ve never done them. I think it’s silly to put all that false enthusiasm into things you’re not really passionate about and that die out before the end of January. Most people do what most people do, and I’ve never been one of those people. Probably because I had a Mom that taught all 5 of us to have the strength to do things our own way, and, we learned from watching her. So instead of spending the early stages of 2017 doing what everyone else does, try instead, to ID a couple of things that you REALLY are passionate about, and make your own path with those things. See if you can lean in to each one of them and look for ways to become a little better at each one. On a daily basis life will throw you a ton of opportunities to gain new perspective, learn something about yourself, learn something about the people you interact with, and learn just about anything you’re open to learning. So keep your eyes peeled. Spend your 2017 looking out and leaning in, instead of simply trying to follow the crowd. You never know where they’re going, and besides, it’s always more interesting to make your own path! Good luck and here’s to you having a wonderful 2017! Softball Excellence Softball Journal. Ready for your thoughts, and dreams and BIG goals of 2017! Create your own custom cover and use the free Player and Coach Journal Download to make your journal come to life!